Celtic and Scotland left-back Kieran Tierney is nearing a return following ankle ligament damage. 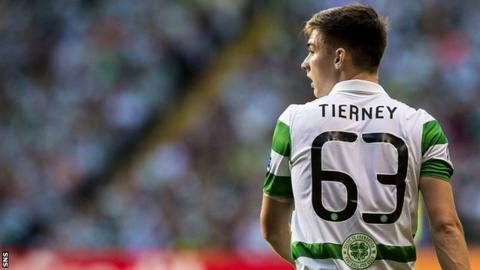 Tierney, 19, last played in October and Celtic manager Brendan Rodgers said: "He's now back training, he played in a practice game and he looked fantastic. "Now he'll be firing and ready for the second part of the season." The Premiership leaders return from their winter break with a Scottish Cup fourth-round meeting with Albion Rovers on Sunday. Defender Tierney, who was also nursing a shoulder injury, and team-mate Moussa Dembele, 20 - Celtic's top scorer - have been linked with moves in recent weeks. But Rodgers said: "All these young players, Moussa, Kieran, you see them linked with five, six, seven clubs. That's part of the game nowadays. "Their concentration is very much here, they've still got a lot of learning and development left in them. The most important thing for Kieran was getting back fit. "The time out wasn't great, in terms of him missing games, but it will do him good because he was able to repair his shoulder, the ankle and get that bit stronger."